It was another action-packed evening of Champions League football as PSG, Tottenham and Napoli all grabbed vital victories. 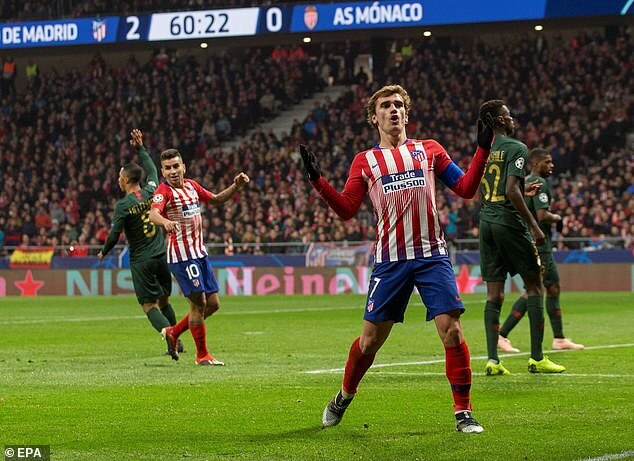 Barcelona sealed top spot of their group as did Porto, while Borussia Dortmund slipped up at home to Club Brugge and Atletico Madrid piled more misery on Thierry Henry’s Monaco. Here, Sportsmail take you through all the things you might have missed from Wednesday evening’s action. Paris Saint-Germain supporters are beginning to turn on Adrien Rabiot after reports in Spain suggested the midfielder has told Barcelona he wants to play for them next season. 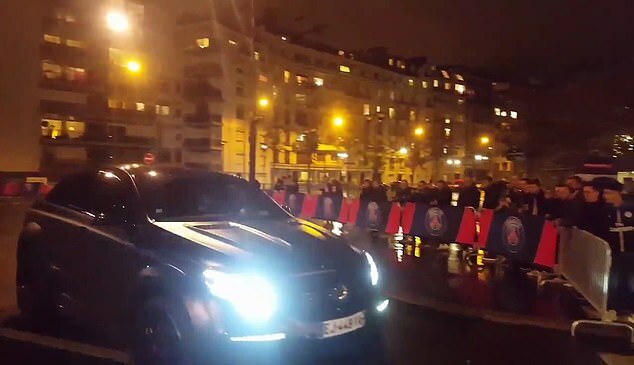 ‘Rabiot, go to Barcelona!’ a bunch of fans screamed as he arrived at the Parc des Princes ahead of their Champions League clash with Liverpool. The 23-year-old graduated through PSG’s youth ranks but wants to take a step forward in his career and is planning to run down his contract – which expires at the end of the season – to join Barca on a free. PSG’s fans may just get their wish in the summer. Marouane Fellaini, take notice! Not only did Antoine Griezmann manage to make it on to the pitch with his mascot, but he also got his knees to do his shoelace for him. 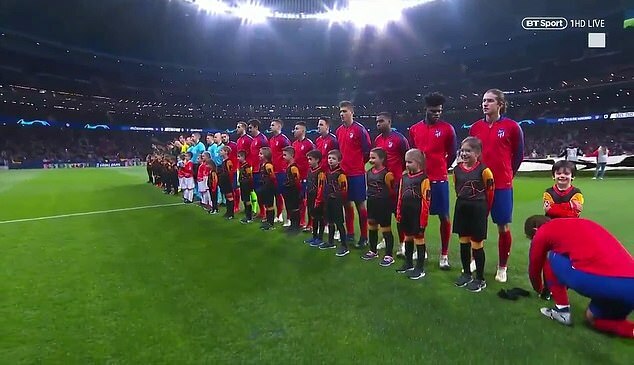 The little chap certainly seemed to enjoy having a world class player at his disposal, crossing his arms and smiling for the camera as it panned across the two teams before kick-off. 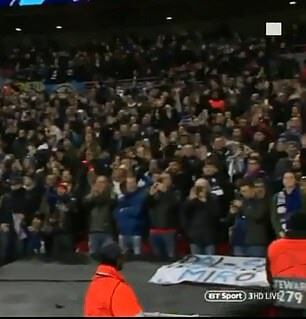 He was cheered on to the pitch by the opposition fans as he made his return to Atletico, but within minutes it was clear Radamel Falcao was in no mood to be paraded. Falcao may well still hold Atletico dear in his heart but on Wednesday he looked desperate to leave a bite mark on his old club and drag Monaco back in to it. The striker almost made an instant impact after coming off the bench in the second half, turning sharply in the box and shooting on the spin, but his effort was straight at the keeper. It was a warning that he still possesses the nous in front of goal that made him such a hit at the Spanish club. He got his golden chance seven minutes from time when the referee awarded a penalty for handball and sent off Stefan Savic. It was a chance to score on his former stomping ground and end a miserable run. It went horribly wrong. Falcao completely missed the target. He still has never scored a penalty in the Champions League at three times of asking now. Another Champions League away match and another defeat for Liverpool. 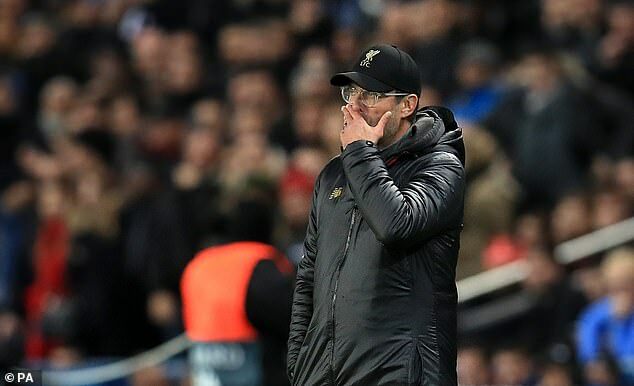 Wednesday’s loss against Paris Saint-Germain meant it was the first time in history a Liverpool side had lost all three of their away matches in the Champions League group stage. It also marked the first time ever they have lost four successive European games on the road. It’s something Jurgen Klopp will have to address, particularity if he has ambitions of progressing further into the tournament. As it stands, things are right in the balance with Napoli’s win over Red Star Belgrade meaning Liverpool must beat the Italians in the final game to ensure a place in the knockout rounds is secured. It’s just as well that match will be in front of their own fans. 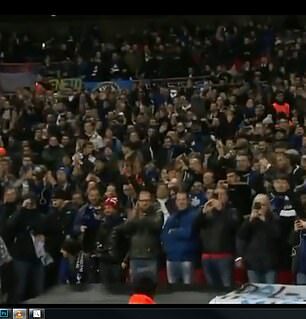 Inter Milan supporters showed their respect to a man they called ‘Il Governatore’ in the least macho way possible. It was irony at his best. 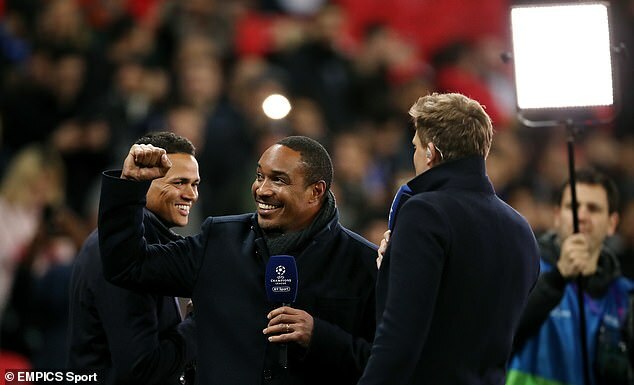 As Paul Ince turned to look at the Italians who had made the long journey to Wembley, he was greeted with a sea of erratic waves. It was like they were attempting to mimic that famous Dele Alli meme all at once. Ince, who spent two seasons at the club, clearly enjoyed the commodore and appeared touched by their tribute to him. He cracked a smile before adding: ‘They are fantastic fans.’ It was a nice touch in fairness. 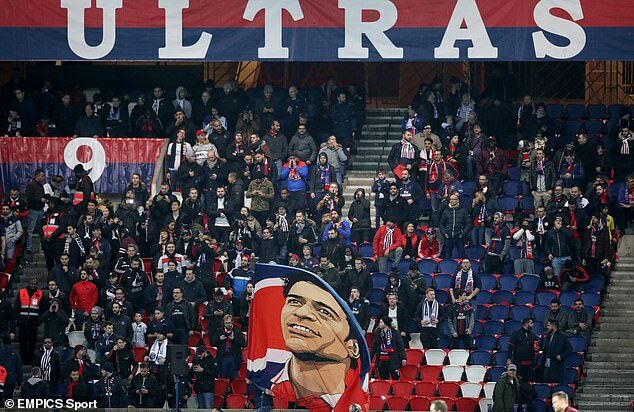 The bright lights of the Parc des Princes attracted all the stars on Wednesday evening. 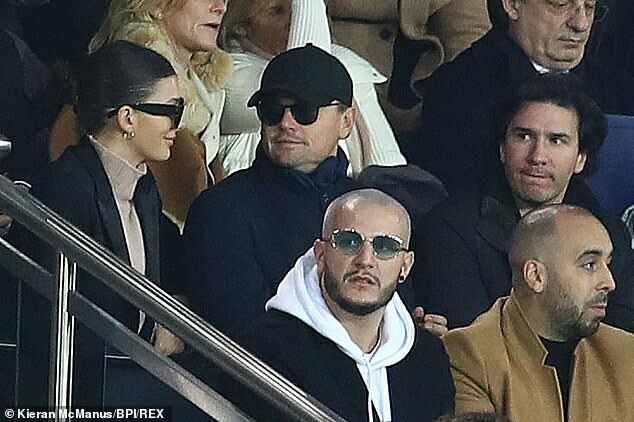 Leonardo Di Caprio, Mick Jagger and Khabib Nurmagomedov were just a few of the A-listers spotted in the stands for PSG’s Champions League clash with Liverpool. 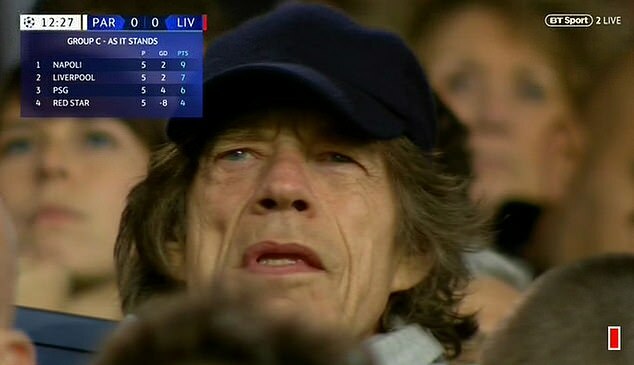 It would be harsh to blame Liverpool’s defeat on Jagger, but there is good reason why no team would want the support of the Rolling Stones star. The rock singer has an unfortunate history of watching the teams he supports, particularly at the World Cup. 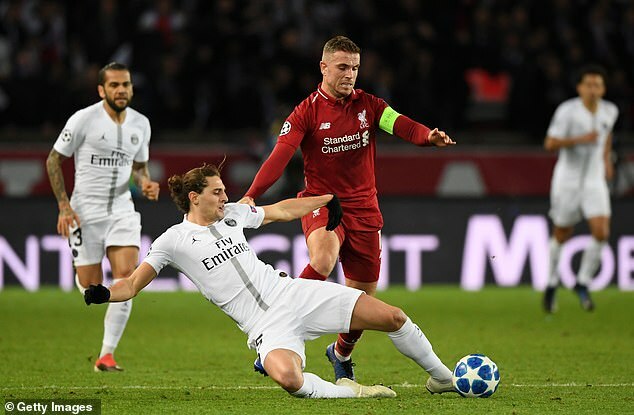 He is actually an Arsenal fan, but it’s assumed he was rooting for Liverpool on Wednesday as they fell short in Paris. Perhaps the curse is real. 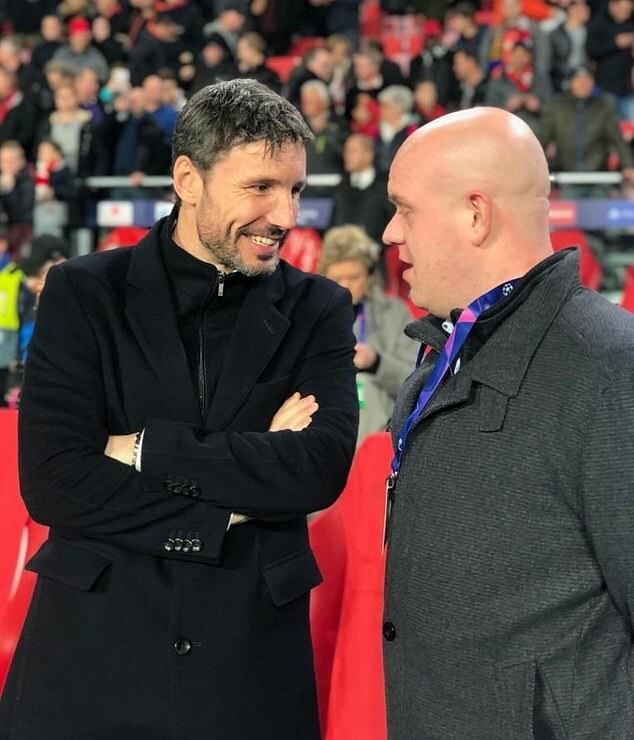 Darts maestro Michael Van Gerwin was at the Philips Stadium on Wednesday evening to watch PSV. 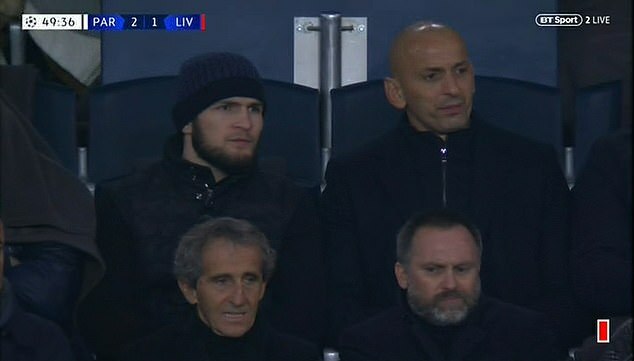 He would have hoped to have seen the team in red and white pull off a miracle but instead was treated to a Lionel Messi show. The Barcelona forward scored one and assisted the other as the Spaniards sealed their spot at top of the group. Van Gerwin did get to see a consolation goal courtesy of his countryman Luuk de Jong, so that was something.